CALLING ALL CRAZIES! Welcome to Lunatic Central, where we showcase the best thing about RaceRaves—you! Here you’ll find an ever-changing gallery of your fellow Raving Lunatics in action, from the rugged coast of Maine to the Great Wall of China to the frozen tundra of Antarctica. We’ll also features links to articles that profile our members. Got a shot of you running the world in your RaceRaves gear? Send your best photos to [email protected], and we’ll proudly add you to the rotation. And keep a close eye on this page—we’ve got a lot more in store for Lunatic Central! 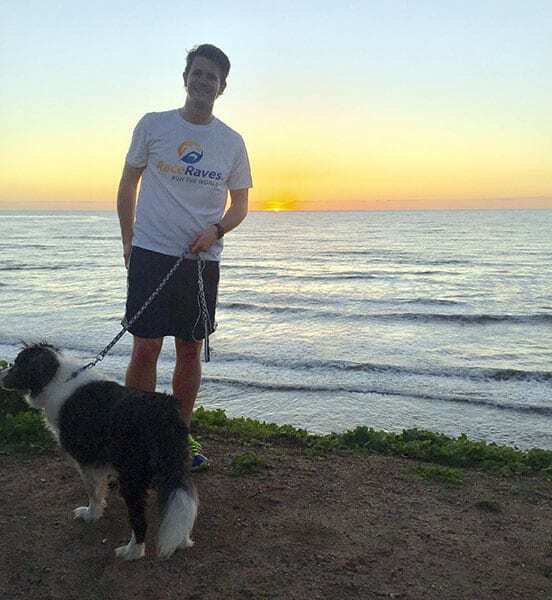 Michael M. likes puppies, long runs on the beach & awesome sunsets—all at once! "Mahalo" means "You rock!" Happy Honolulu Marathon finishers Susan K., Donn R. and Jeff R.
Katie H. & Mike S. in search of a Raving Lunatic: these two claim to know a Mad Hatter! Got the energy & lunacy to be a RaceRaves am-badass-ador? If so, drop us a line! You're never too young to start raving! Look good, feel good, run good Alys D.! Life's a beach, as Kelli H. can attest!